Therana's Lawman is a common Intelligence creature card. It is part of the Houses of Morrowind expansion. In addition to the card's availability in the Houses of Morrowind expansion, three copies are included in the Dagoth's Might theme deck, one copy in the Telvanni Ambition theme deck, and one copy in the Tribunal Glory theme deck. "[Sigh]... Guess I'll have to kill you." 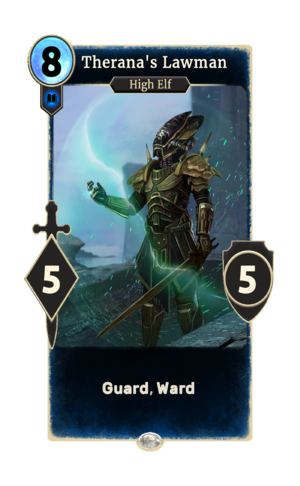 This card likely depicts Mollimo of Cloudrest, who first appeared in Morrowind as a Lawman of House Telvanni who worked for Mistress Therana in Tel Branora. This page was last modified on 2 March 2019, at 00:01.